JGIM Web (published only here on the Web and not indexed in MEDLINE). Please read carefully and follow the appropriate instructions. As the official journal of the Society of General Internal Medicine, JGIM encourages submission of articles aimed at improving patient care, education, and research in primary care and general internal medicine in all settings. Submissions must be original and not currently under consideration for publication in another peer- reviewed medium (paper or electronic). JGIM is committed to making the review process as timely and useful as possible for authors. JGIM ranks #1 in impact factor among all Primary Health Care Journals. Read more here. If you have questions, please contact the editorial office. Make sure you read the full instructions for authors. JGIM Print has a unified process for all submissions including editorials and letters to the editor. Please click the button below to access the submission site. On April 1, 2019 JGIM moved to a new editorial manager. If you submitted a manuscript prior to April 1, 2019 please contact the editorial team at jgim@iupui.edu to inquire about the status. 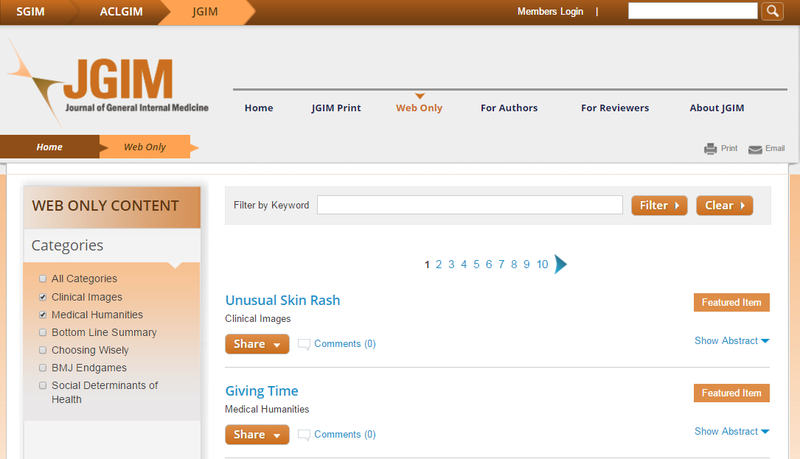 JGIM Web hosts Clinical images, poetry and personal narrative prose submitted by medical students, residents and fellows. Please review the guidelines by clicking the appropriate link on the right or contact the deputy editor using the links links below. The living hand of the physician. The hand that heals, that caresses and comforts, that steadies over the years with growing confidence, that cuts and mends, that forms the link between doctor and patient. There are many uses of the hand in medicine, but we are proposing another use: the hand that writes. Whether a poem, a short story, or a quick note, writing allows us to synthesize and organize the many scattered thoughts, emotions, and experiences that circulate loosely through our minds. Writing allows us to etch our ethereal thoughts onto paper with all-too-real ink. It is often said that “writing allows the writer to find out what he believes.” True, but it is much more than that: writing forces the writer to confront what he believes. There is something about seeing a thought written in hard ink that cements it in reality, forcing the writer to consider the source and meaning, unable to erase what his eyes have seen. In addition to all of this… writing is fun. In order to further support the humanities in medical education, JGIM, Web Edition will host “The Living Hand” humanities section for residents and medical students to submit poetry or personal narrative prose for publication on the web page. In “The Living Hand” humanities section, we will publish a new article of poetry or prose written by a medical student, resident or fellow every two weeks, thus providing plenty of opportunities for fresh voices to share their stories. We are looking for writing that is true to who you are. Share your lessons with us by showing through your stories rather than telling. We encourage all of you to capture the thoughts that are bouncing around in your head, and submit to “The Living Hand” for publication. The white space awaits your words. JGIM Web Edition will host “Clinical Images” a section for residents and medical students to submit images with a brief accompanying description for publication on the website. We will publish content based on these submissions and also content recreated from older editions of the print journal. We are looking for images from cases you saw that you found educational.